The view out my second-floor window. All night and all day there’s been the sound of metal scraping against asphalt as snow plows ply our streets. For the past 48 hours, there’s been a blizzard here in New England. As the world’s weather is becoming more extreme, the traditionally moderate climate of England where my family lives is experiencing more pelting rainstorms, snow, and hot temperatures. And on the opposite side of the Atlantic Ocean where I, my kids, and my mother live, New England is also getting more windstorms, nor’easters, snow, and blazing summer heat. 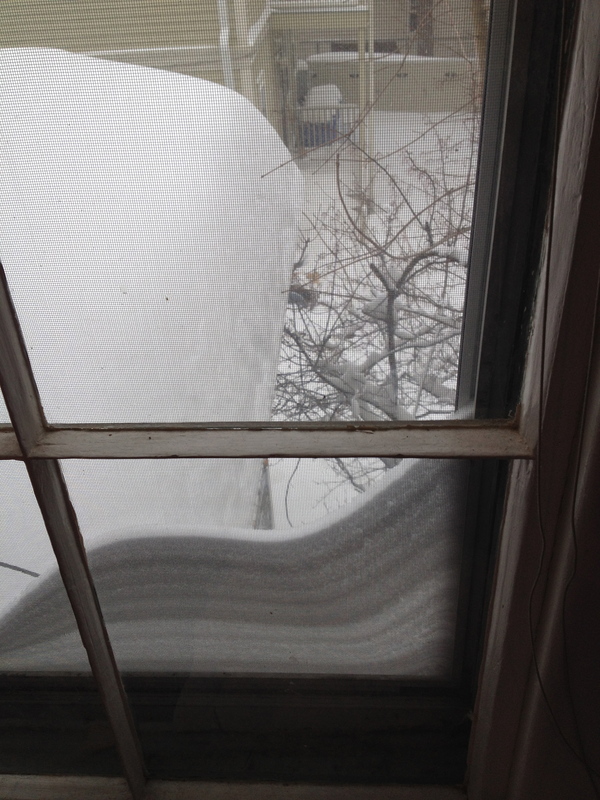 For the past two days, we’ve been having the sixth worst blizzard in Massachusetts’ history. No one wanted to underestimate or be unprepared for the blizzard, so for the two previous days, the news channels have been full of information about its predicted 24-36 inches of snow and gusts of 70 miles per hour. 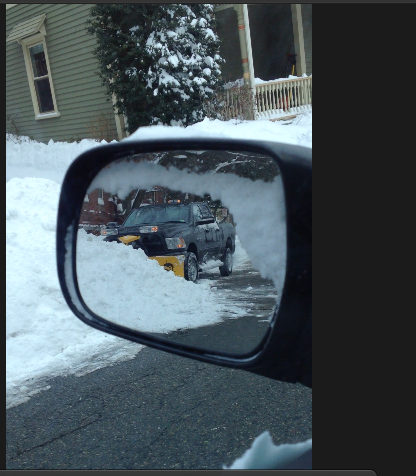 The mayor of Boston shut down the public transportation system when the storm began, and ordered all cars off the road. It hasn’t been so quiet here in the Boston region since that day after the Boston Marathon bombing when we were told to stay inside while the police searched for the bombers. See my post about this here. 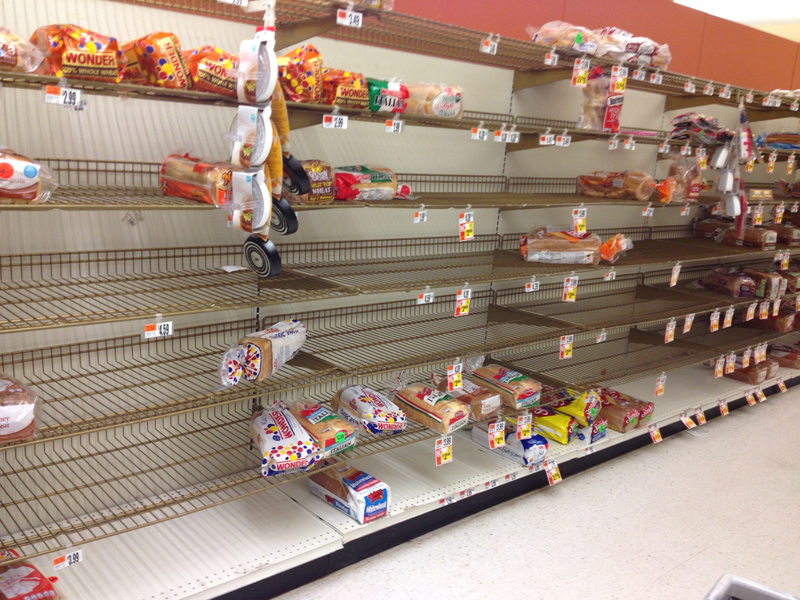 For the blizzard, we were told to have enough provisions on hand to last at least several days. 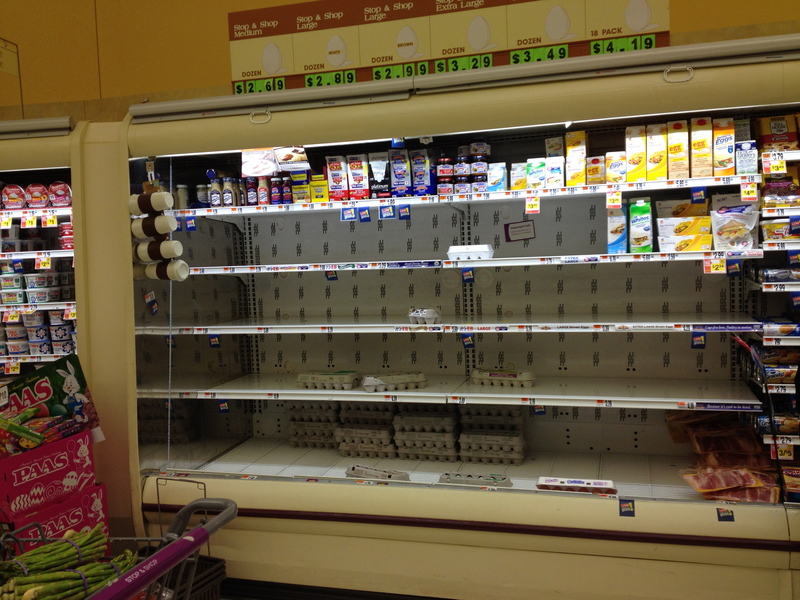 When I went to get food, eggs were almost gone . . . I grabbed three loaves of bread, a jar of peanut butter, containers of juice, bottled water, and canned goods, in case the gas and electric went out, and pasta, flour, sugar, and chocolate chips, in case the utilities stayed on. 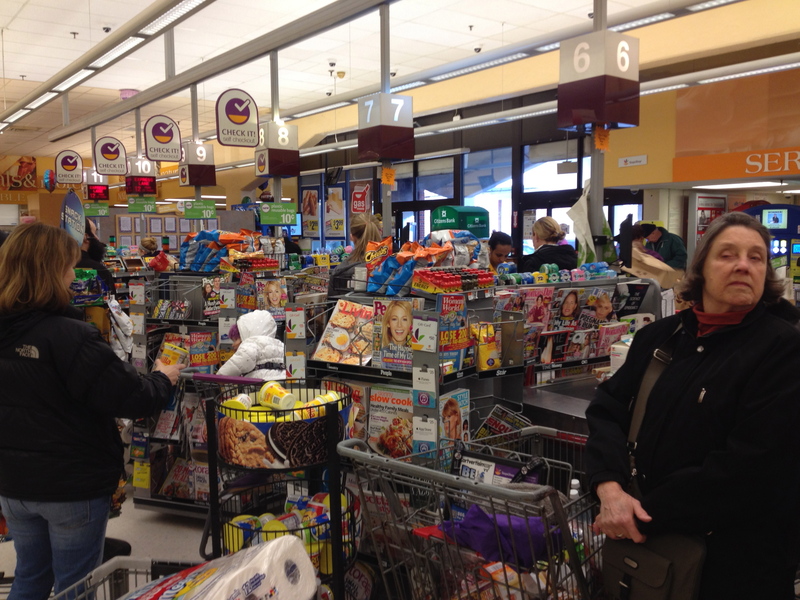 The grocery store was very busy, but as one shop assistant told me, it was nowhere near as bad as last night when the queues stretched to the very back of the store. The storm began in the early morning hours of yesterday, Tuesday, dropping 4 inches of snow per hour, with gusts of 70 mph. Luckily, our boiler, which is on its last legs, and the gas and electric, held up, so it was a day of watching Netflix and baking chocolate chip cookies. 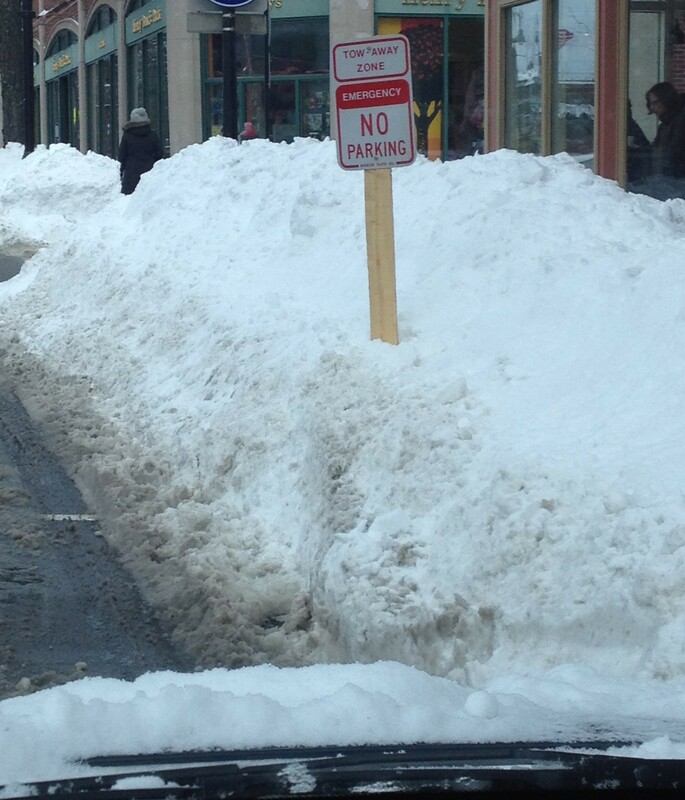 Boston and other towns declared snow emergencies, with two days off school for the kids. Today, Wednesday, was quite pleasant–cold, around 19 degrees, but no wind. 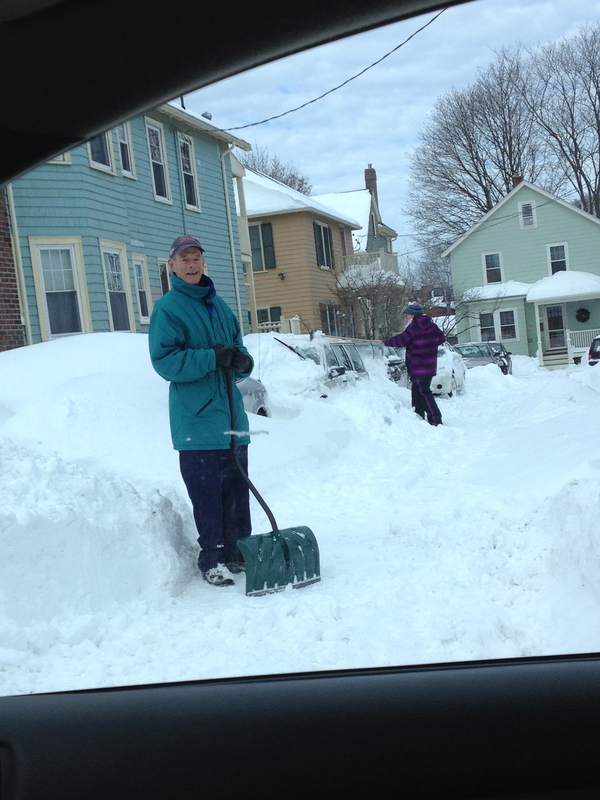 Everywhere people, including my neighbors, were out shoveling. 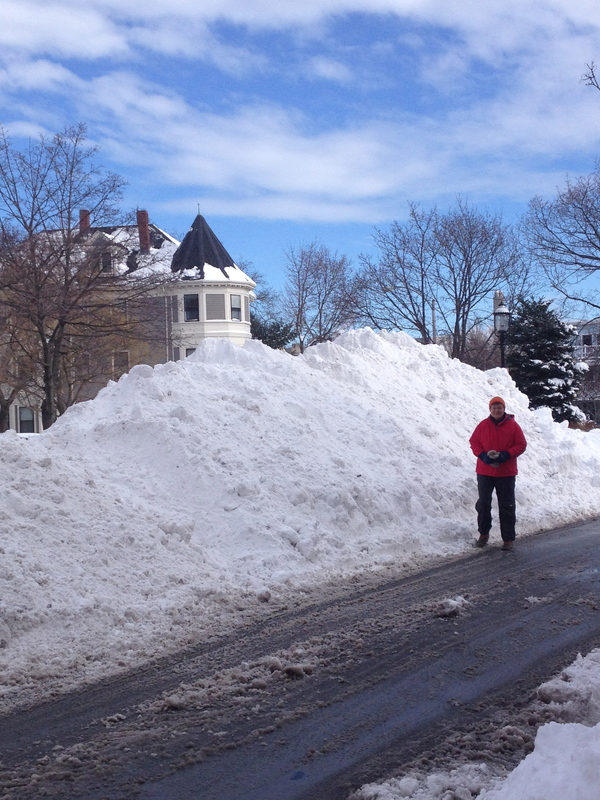 That white mound behind the man is his car covered by snow. 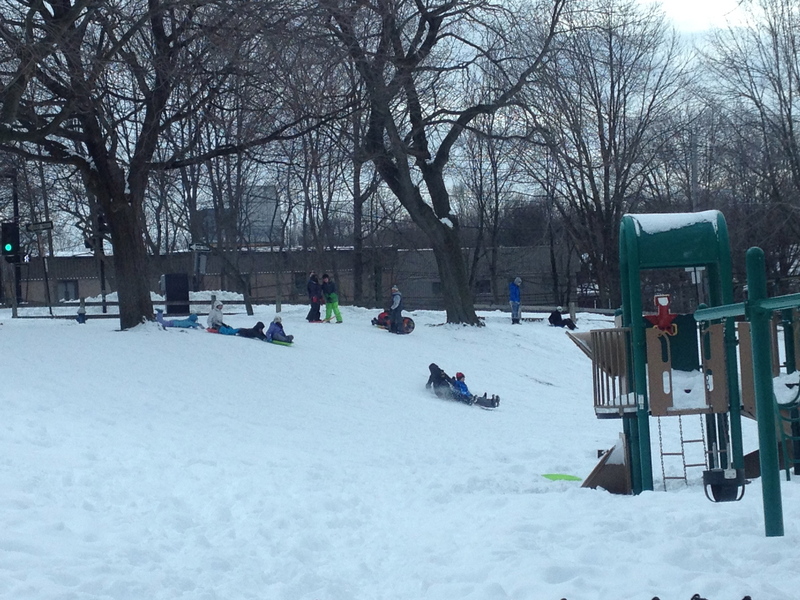 Children, of course, had the best time, making snow angels and igloos, and sledding. 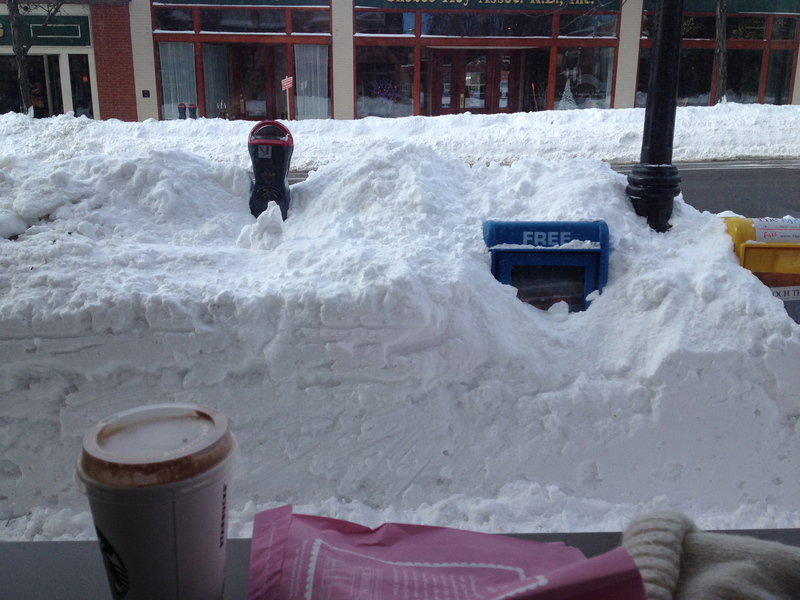 After an hour of shoveling out the sidewalk and the car, we took ourselves off to Starbucks for a well-deserved treat, looking out at the mounds of snow while sipping our hot chocolate. 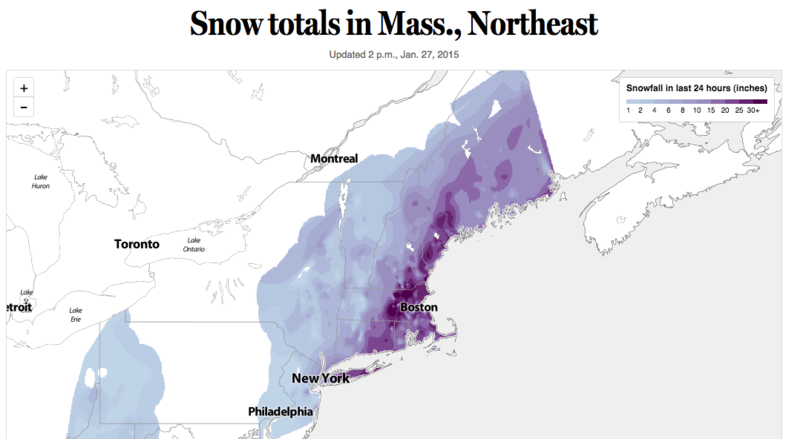 We fared pretty well, but New England towns along the coast caught the brunt of it. 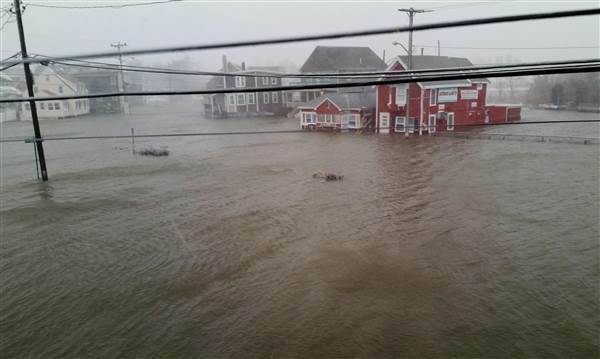 Marshfield, Mass., had extensive flooding. 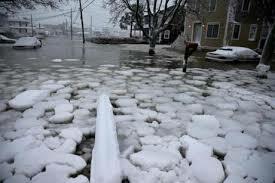 We in and near Boston got through pretty much unscathed, except for huge bills for our cities and towns for snow clearance, but there were people on the coast who lost their homes. A blizzard is a force of nature not to be ignored.